Surprise your taste buds with an unexpected combo. Cranberry sauce, balsamic vinaigrette and a hint of orange give this ham a tangy twist. Place ham in shallow pan sprayed with cooking spray. Score ham; cover with foil. Bake 1-1/2 hours. Meanwhile, microwave remaining ingredients in microwaveable bowl on HIGH 30 to 45 sec. or until cranberry sauce is melted. Reserve 1-3/4 cups cranberry mixture. 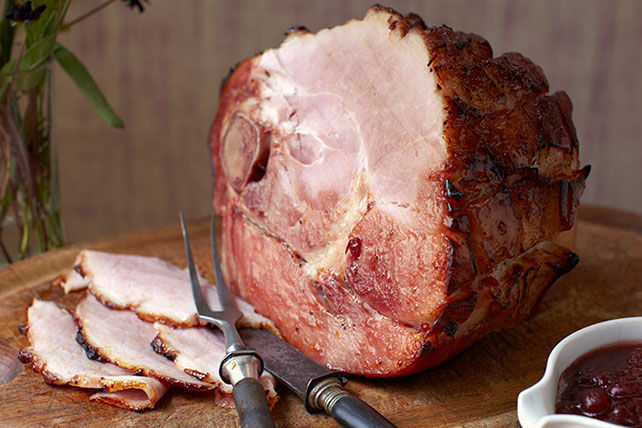 Remove foil from ham. Bake, uncovered, 1 hour or until ham is heated through (140ºF), brushing with remaining cranberry mixture every 20 min. Serve with simple sides, such as your favourite hot steamed fresh vegetable and a baked potato.